Come ski the Tahoe Rim Tour! First run in 2008, the Tahoe Rim Tour has become one of the Far West region’s premier cross-country ski races, with stunning scenery that can’t be beat. 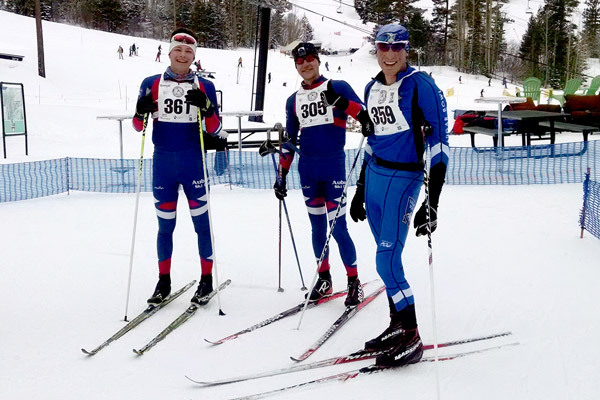 It is a fundraiser for the Far West Nordic Ski Education Association so you help support cross-country skiing in California and Nevada while enjoying the event. Registration and full details can be found here. The race starts at North Tahoe High School in Tahoe City and begins on a number of trails at the Tahoe XC cross-country center. Then it climbs north up snow-covered switchbacks on the “Fiberboard Freeway” (an old logging road) to Starratt Pass on the rim of the Tahoe basin at about 7,800 feet. Drinks and snacks are available at an aid station at the pass. From the aid station, the course follows the Tahoe Rim briefly to the east, with breathtaking views of Lake Tahoe and its surrounding basin to the south. Next, the course drops off the rim through forest to the north, eventually reaching Northstar. After taking a brief tour over a handful of Northstar cross-country trails, the course reaches the finish, 26 kilometers from the start. Not far from the finish, at the mid-mountain Nordic lodge, awards, raffle prizes, and a cornbread-and-chili lunch are provided at the post-race party. Following the party, racers may ski or take the gondola down to the Northstar village, where buses take racers back to their cars at the start in Tahoe City. The Tahoe Rim Tour is, in fact, a ski race, and the competition is fierce at the front of the pack. However, further back in the pack, there will be many skiers who are more focused on the exhilarating scenery, camaraderie, and fresh air than on the competition. Skiers of all abilities and all levels of competitive ambition are warmly welcomed and encouraged to participate. The race has two divisions: classic and freestyle. The classic division starts a half hour before the freestyle division. Skating is not allowed in the classic division. In the freestyle division, all Nordic techniques are allowed, though most people will skate. The classic division is special in that it is the longest and the only point-to-point classic race in the Far West region. Skiers in the classic division earn points toward the Fischer Cup race series. Both divisions count toward the Master’s Challenge and Sierra Ski Chase race series. Information about these series, and lots more, can be found at farwestnordic.org. Registration and full details can be found here.